During the last weekend Xin Dong Cheng Space for Contemporary Art in 798 district in Beijing had an opening of new works by Feng Zhengjie. The red pink flowers on the deep green base where his traditional lady portrait is hidden gives a mystery to his new paintings. They are strong in colors and extremely beautiful. The installation with flora hanging in a curving way, 6 meter above a mirror that reflects the enlighted floras gives an impression of an everlasting image. The show was pop and powerful. The evening continued to some opportunity to mingle with invited guests that was entertained with drinks, food and music. 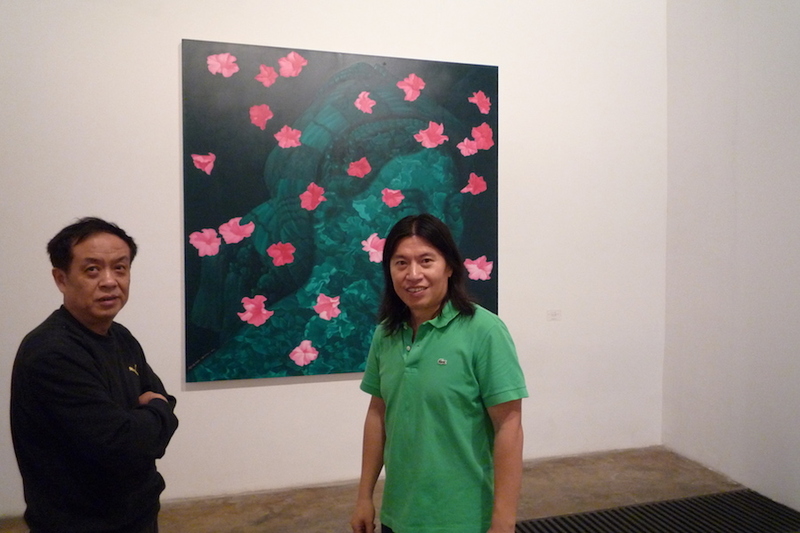 Among the wellknown artists around I noticed old friends like Zhong Biao, Ling Jian, Chen Wenling, Liu Wei and many others. It was a fun and relaxed evening.